The New York Times has come under fire from Jewish organizations for launching a website aimed at tracking how Jewish lawmakers are voting on the Iran nuclear agreement. The feature, titled "Lawmakers Against the Iran Nuclear Deal," includes a list of legislators currently opposing the deal. Critics say the chart feeds into a larger narrative promulgated by the Obama administration that Jewish Americans oppose the deal because they feel that it would endanger Israel. The issue of dual loyalty—or claims that lawmakers are more loyal to Israel than America—has become a trademark criticism of administration supporters seeking to discredit opponents of the Iran deal. "Though more Jewish members of Congress support the deal than oppose it, the Democrats against the deal are more likely to be Jewish or represent Jewish constituencies," the Times writes on the site. 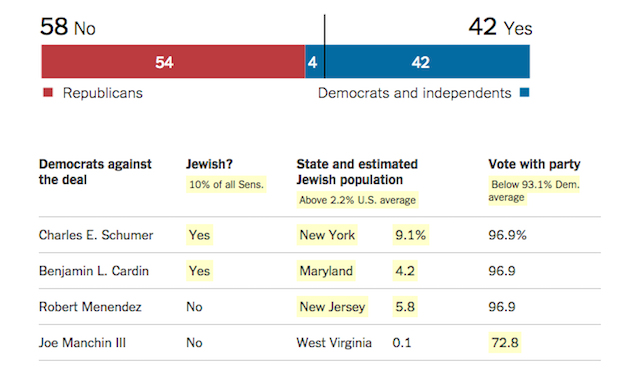 The article shows in graph form all lawmakers in the House and Senate who oppose the deal and whether they are Jewish. It also includes the composition of a lawmaker’s district, displaying the percentage of Jewish individuals they represent. Jewish leaders criticized the Times for feeding into anti-Semitic stereotypes. "It’s a grotesque insult to the intelligence of the people who voted for and will vote against [the deal]," said Abraham Cooper, associate dean of the Simon Wiesenthal Center, which combats anti-Semitism. Cooper said it evokes images of "Jewish pressure" and "Jewish money" influencing the Iran vote. This type of reporting "does a disservice to the issue and that's the exact opposite job of the New York Times," Cooper said. "They have some explaining to do. Why’d they do it? Shame on the New York Times for the timing and implications of this piece." A nationwide poll released this week found that a plurality of American voters, or 37 percent "see accusations of Jewish lawmakers having dual-loyalties on the Iran deal as anti-Semitic," according to the findings, which were published by the Israel Project. "This includes pluralities across all partisan and ideological lines," the poll found. "Even among supporters of the deal, 37 percent view these accusations as anti-Semitic." "As a point of comparison, 35 percent said they saw the Confederate Flag as a symbol of racism in a New York Times poll in July 2015, a position that the paper vocally endorsed," said Nathan Klein, lead pollster at Olive Tree Strategies, which conducted the poll on the Israel Project’s behalf. One senior official with a Jewish organization based in Washington, D.C., expressed shock when sent a link to the Times feature. "I guess we should be grateful the New York Times chose not to illustrate its Jew tracker by awarding a six-pointed yellow badge to every Jewish opponent of this catastrophic sellout." 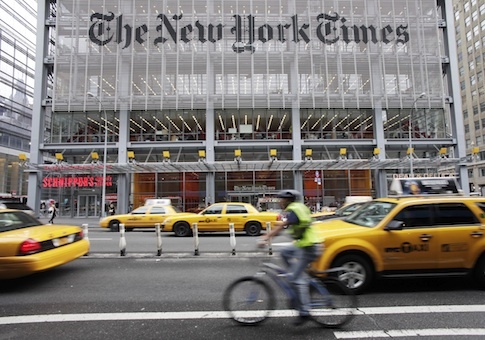 A New York Times spokesperson declined to comment on the criticism leveled against the website. While other websites have made note of Jewish lawmakers both for and against the deal, the majority of these outlets are directed primarily at a Jewish-American audience. UPDATE 10 September, 2015, 8:15 PM: Following publication of this report, the New York Times removed the column noting whether each lawmaker was Jewish from its chart. The column was removed in an update to the post without acknowledgment. This entry was posted in National Security and tagged Iran, Iran Nuclear Deal, New York Times. Bookmark the permalink.